The competitive landscape of the cellphone core integrated circuit (IC) business has completely transformed over the past five years, with Qualcomm Inc. and Samsung capitalizing on the rise of smartphones and 4G. In the market for application-specific mobile handset core ICs like baseband and radio-frequency semiconductors, Qualcomm in 2012 reigned supreme with 31 percent market revenue share, according to the IHS iSuppli Wireless Competitive Landscape Tool from information and analytics provider IHS (NYSE: IHS). The San Diego-based chip maker has held the top position since 2007 and even enlarged its lead by 8 percentage points during the period. South Korea’s Samsung Electronics was the No. 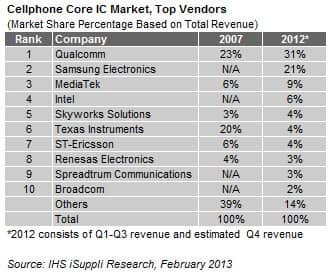 2 vendor after Qualcomm, with a 21 percent share, after not even ranking in in the Top 10 in 2007. Together the two companies accounted for more than half of the total market, with the next eight vendors in the Top 10 accounting for another 34 percentage points of share. The other vendors among the leaders were, in descending order, MediaTek, Intel, Skyworks, Texas Instruments, ST-Ericsson, Renesas, Spreadtrum and Broadcom. The Top 10 enjoyed a collective 86 percent share of the market. The cellphone core IC space encompasses semiconductors that provide mobile handsets with wireless wide-area-networking (WWAN) communication and application-processing capabilities. The market segments here include handset core ICs for analog baseband, digital baseband, power amplifiers, radio and intermediate frequencies, high-level operating systems and software processors, and other multimedia or graphics coprocessors. Of the companies that did not even rank back in 2007, Samsung has climbed the quickest, landing in the runner-up spot, driven by its presence in the applications processor space. Also among those making the jump from outside the Top 10 is Intel, in fourth position at the end of last year after acquiring Infineon’s wireless division. It remains to be seen how successful Intel will be in utilizing the acquisition, finalized in 2011, in order to increase the breadth of its mobile product offering and increase the likelihood of winning design slots for those mobile products. Intel is also starting to see some signs of life with the Atom processor and its inclusion in handsets from Motorola along with other original equipment manufacturers. Two other vendors also broke into the ranks of the Top 10 in 2012. In ninth place, Spreadtrum expanded its digital baseband IC revenue by more than 370 percent within the five-year period. Broadcom likewise expanded revenue by a similar dizzying magnitude to land at No. 10—thanks to baseband IC revenue finally gaining traction by ramping design wins since 2011 at Samsung. While Qualcomm increased its lead at the top from 2007 to 2012, Texas Instruments fell from second to sixth place—down from a 20 percent share to 4 percent. TI’s proprietary OMAP product line of chips for portable and mobile multimedia applications has not taken off as quickly as expected, and the company as a result could not offset its planned exit from baseband products. Another vendor near the top in 2007 that experienced a decrease in market share was ST-Ericsson, shrinking 2 percent to a 4 percent market share. The structure of the mobile handset core IC market will continue to shift, particularly as LTE becomes more widespread. Baseband chips, already accounting for more than half the revenue of the total handset core IC space, will maintain their pre-eminence in determining the market-share gains and losses of industry vendors moving forward, IHS believes. Nonetheless, the future will also be driven by the ability of any given IC supplier to provide platform solutions that optimize the system-level design of all of the ICs, making up the handset’s core chip architecture.